Arthur A. Levine Books (Scholastic), 2008. 96 pages. 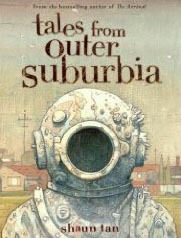 Truly Shaun Tan is the supreme master of the short-short story genre! This book contains fifteen illustrated stories that are strange, strange, strange. They are bizarre, they are haunting, and they are completely delightful. There's water buffalo who lives on the corner and points people in the right direction. There's an exchange student who leaves a surprising gift. There's a boyish expedition to the edge of the world. All the stories are told as if someone's matter-of-factly telling something that happened to them, once. This is the sort of book you have to share. I found myself exclaiming over each story, so of course I got my teenage son to read it. Even that wasn't enough, as I decided I had to share it with my other son, too, so this is his present for his twenty-first birthday. As The Arrival did, in many ways this book creates an entirely new category. Let's see, I suppose you might call it illustrated science fiction short-short stories. I think I'll just call it irresistible. Try it yourself -- read one story and see if you aren't too intrigued to stop.